The reservation request form you will be guided to is not an onlinereservation request. Please wait for our reply/offer. 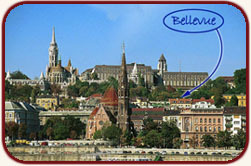 In order to rule outthe possibility of our reply letter being relegated to the spam/bulk mail -as has been the case lately on a few recent occasions -, please add oure-mail address (info@bellevuebudapest.com, judit@bellevuebudapest.com) toyour address book. The automatic confirmation email of having received your reservationrequest, as well as our replies to your query sometimes get filtered asspam, so please don't forget to check your junk mail folder. During high season, and for the 3-week period prior to and following highseason, due to the number of our rooms (altogether 6), we can offeraccomodation for 1-night reservation requests only 5 days prior to date ofarrival, and in case of 2-night reservation requests, 10 days prior to dateof arrival. Nonetheless, please feel free to submit anytime your reservationfor such length of stay, as we do make exceptions based on the status quo ofour bookings (ie. a 1 or 2-night gap in-between two bookings).